Diagonally across the state of Florida is a small town called Fort Pierce. There, in the late 50’s, a group of African American artists taught themselves how to paint landscapes. Those landscapes would become famous representations of a part of Florida unique only to its southern, coastal geography well below the city I grew up in. By the 90’s, the creators were praised together as a historic art movement. They were coined The Florida Highwaymen. Using inexpensive frames, their finished pieces of wildly technicolor art were often sold on the side of US-1 where tourists indulged, buying selections as a bargain souvenir. and the Royal Poinciana (Aka “The Flamboyant tree”), a heavily reoccuring Highwaymen motif, often cited as having one of the most beautiful blooms. 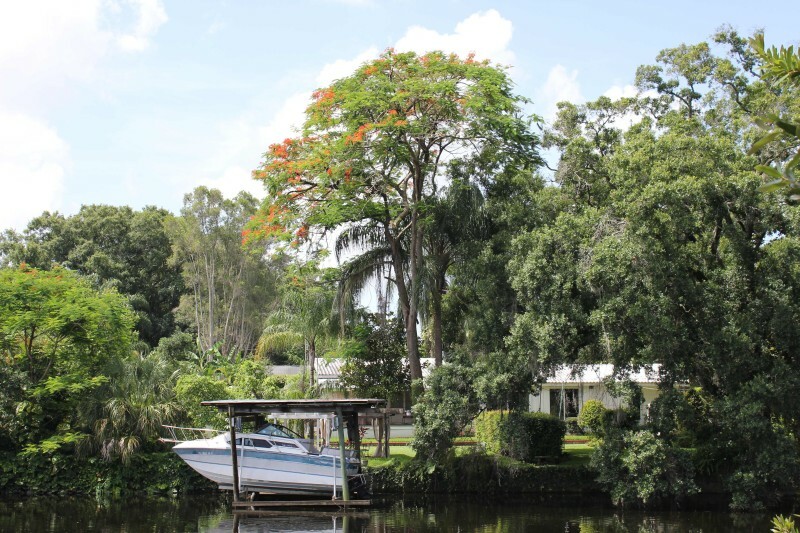 A couple weeks ago, while driving over a bridge spanning the Hillsborough River (just a couple blocks from my house), I noticed a pop of orange. A Royal Poinciana I wondered? I pedaled to the river. From a distance, I saw the tree reaching into the sky, vibrant. But on getting closer, I couldn’t find a clearing on the shore to snap a picture. Cutting through a large park, I stumbled on a homeless camp. Four men sat near the river, drinking 40’s, tending to a grill tucked near the bushes. Smoke rose heavily from a pile of broken palm branches: fodder, as the men roasted a makeshift lunch. Together, they spied me as I crept up with my camera. Breaking their comfort zone, I must have caught them off guard when I asked, simply, their permission at a better vantage point to the tree. With heads nodding in tandem, I was given access. Over the past decade, we’ve been experiencing more oppressive heat, more brutal storms, shorter winters, and a much earlier Spring. Regardless of the argument–the laundry list of global warming precipitates–this odd Poinciana bloom (by a tree that should not be flourishing in my neighborhood) gives us something to admire within a potentially tragic shift of climatic extremes.